Don't forget to read my whole story about Coren's research! 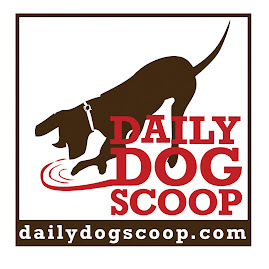 GET THE SCOOP IN RIGHT IN YOUR INBOX: Enter your email in the box on the right to get Scoop's take on the latest dog news emailed to you! Dogs are emerging as a great treatment option for autistic children. Earlier this year, I wrote about Kaleb, and the autistic twins that he is helping. 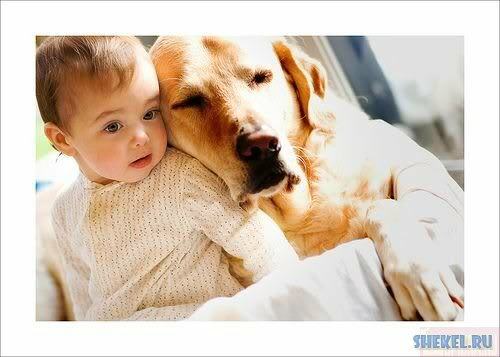 And now a study has been released by Université de Montreal and published in Psychoeuroendicrinology that found that dogs "had a clear impact on the children's stress hormone levels." They tested he cortisol levels in the saliva of 42 autistic children before a service dog was introduced, during a visit with the dog, and after the dog was removed. They found a dramatic impact for the time which the dog was present. This was the first study of its kind, and according to the lead scientist, Sonia Lupien, "Our results lend support to the potential behavioural benefits of service dogs for autistic children." Let's hope so! Over a year ago I wrote about my buddy Baxter, who was in need of a special home. Baxter was in the custody of Homeward Trails Animal Rescue--the same folks that took me in when I was down on my luck. Not only that, but Baxter's adoption coordinator was Lisa Milot, who also helped me navigate the foster care and adoption process! I was in foster care for six months, and was even returned once. For Baxter, it was well over a year. But Lisa and the team at Homeward Trails worked with him to get help for his anxiety and energy, and much to my delight, I received a comment on my original story to share the news that she adopted Baxter over the summer and he is doing great! 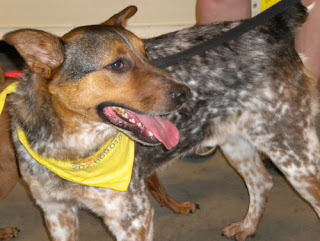 I checked in with Lisa, and she told me that the Maryland couple met Baxter at a local adoption event and seemed like a great fit--especially since they had experience with other cattle dogs. Since Baxter had a some trouble finding a fit in the past, they did a "trial adoption"--which went so well that Baxter found his forever home. The couple recently updated Lisa, telling her that Baxter "has just been the sweetest, most loyal, not to mention the most playful dog I could have ever asked for." To give you an idea of how much progress this is for Baxter--he used to have to wear an e-collar all the time because he would get anxious and chew his tail until it was bloody. But look at him now--happy and relaxed in his new home! Sure, Baxter had some trouble finding a home for a while, but like many homeless dogs, he just needed the right fit. I want to thank the dedicated folks at Homeward Trails Animal Rescue who have stood by dogs like me and Baxter while we looked for the perfect forever home for our high energy needs. Most dogs aren't perfect, and some are even difficult. But you give those most difficult dogs a chance and help them through their issues, they might just be the most loyal dogs around. It is also very rewarding for the people, or so my person tells me.